Shall I bring the wet washing in off the line? Life without a washing machine and dryer can be trying at times. I can just feel a washing machine somewhere in my future but in this climate a dryer seems like an unnecessary extravagance. So I will continue to stand, one hand on hip, one on the damp towel, head up weighing the options of a dry or rainy night. Last night, when I was awoken by an almighty crack of thunder, I knew I had lost. I think I will never have soft, fluffy and sweet smelling towels again. What do they do with all the large horns when they kill the cows? They pile them up and leave them beside the road. This is the part of our morning drive when we all take a collective deep breath and hold our noses until we have passed. The pile of horns is huge and resembles a bizarre grouping of sharp yet headless cows. The horns are huge and the putrid stench coming off them is like nothing I have ever smelt on the way to work before. Strangely, there is a random sprouting of sunflowers that has popped up beside the horn patch. Why do I have to go to at least 4 stores before I complete my grocery list? Ahhh. A tough one this, and a conundrum I was familiar with living in Trinidad. For some reason each store has its very own likes and dislikes and this is reflected in its purchasing policy. There is no supermarket chain and all stores are privately owned and operated. So, although one store never stocks low fat milk, another always does, but that is not the right store for cheese. One store has the best olives and meat but they haven’t got the right pasta, another has the best fruit and vegetables but never has apple juice. The list goes on and on. Shopping involves extraordinary levels of patience and petrol. Why is my fridge outside my kitchen and my sink outside my bathroom? This particular Uganda habit arises from a lack of space. Rather than simply build enough space to fit in said fridge or said sink, it is assumed that the hall way will suit just fine. Why do eggs taste a bit fishy? Because they feed the chickens fish. Why is traffic so terrible? There are only 4 traffic lights in Kampala and not enough roads. Paved roads are the exception rather than the rule and a crater sized pot hole can cause a pile up for miles. This is also the answer to the question below. Why does every car squeak, spew black smoke and look like it is about to fall apart? Why do the women seem to be doing all the digging and carrying and the men seem to be doing a lot of talking, gesticulating, reading of news papers and walking empty handed? I have no idea other than to thank my stars that I am not born a poor African woman and that I come from a land of enlightened feminism. But who am I to judge? Does no one work on a Monday morning? The ever present disco across the road continues to pump the music ‘till 2 am on Saturday and Sunday evenings. Who goes to a disco on a Sunday night? I have no idea but I do wish they wouldn’t. I should add that it is not a simple case of music and dancing, rather it is an occasion to listen to the DJ shouting at the top of his voice, singing along to Celine Dion and generally making a nuisance of himself. He brings out the most violent of tendencies within me. It is a tricky thing, being a foreigner in these parts; tricky for the mind. We all perceive each other in such different ways and what I have come to learn and realize, even in my short time here, is how happy people are despite what they do not have. When I was walking around the school on the island facing Bushara I was conflicted. One part of me wanted to rush back to Canada, raise funds and return with computers, decent desks and tons of books. Then I stopped and realized that aid is a very complicated thing. Yes, the school was poorly funded and pupils were writing exams on the seats of chairs; certainly the library was small and insignificantly stocked; but the kids were laughing, smiling, happy and taking their studies very seriously. On the whole they were very happy to talk to me and let me snap photos, only two girls refused and asked for money and those two will probably end up running a municipality in Uganda. Running in with arms laden with supplies is not the answer. Who would ever help themselves if people are always there to run in and save the day? This school was better than most, there were plenty of notebooks and pens, something that many schools lack, yet coming from my high tech school complete with smart board and IT lab, I did wish they had access to computers. Perhaps a better answer is to enable and inspire students to find the tools to empower themselves. They can work for what they need, figure out whom to ask, learn how to raise the funds and purchase their own laptops. Like I said, it is a tricky one. I did wonder, after meeting so many happy people, if perhaps we are the ones who have it the wrong way round. Rather than rush in and tell them what they need, it might be those that live with less who will the last ones standing when the earth implodes under the weight of tossed ipods, computers and appliances. One area that does need some kind of assistance is in the realm of opportunity. I met one young man who anxiously wants to go to University. Unless he is either very wealthy or comes top of his class, his chances are slim. Heaven is a place called Bunyoni. I think I have found heaven and its name is Lake Bunyoni. To be more specific, it is one of 29 islands in the lake and is called Bushara Island. How to describe an island in the middle of a lake, small enough to walk around and never be lost, yet big enough to be completely alone? There is something nostalgic about being on a lake with docks that harks back to summers in Canada; but this was most certainly Africa, from the sounds of the drums, to the Crested Cranes, the cows and goats, the electric green Chameleon and the song like quality of the local language. It is a dusty and very bumpy 8 hour drive ( 11 hours if one of your party loses her clutch ) but it is worth every minute of the drive. The name Bunyoni means lake of little birds and I now see bird watchers and their little binoculars in a whole new light. I am not going to suddenly start pulling out notebooks and frantically writing down the name of birds, but I am amazed. Birds are twitchy, nervous, skittish creatures, always looking around for the next crumb or the bird round the corner who might come by to swipe it. I have never appreciated their sudden movements, finding them a little too startled for me. Yet, lying still on a deck chair in the sun, in front of my safari tent, it was hard to read with all the bird drama going on around me. Diving and swooping they were possessive of their branches and I noticed that they never hop in a straight line. I had to go all the way to Bushara to sit and really look at birds. We slept in permanent tent structures and lived without electricity, hot water or flushing loos for 4 days, and it was quite magical. You could feel your pulse dropping as the birds called and the drums from the lake beat an invitation to church. We ate by candle light, walked back to our tents with torches and zipped ourselves up for the night. We travelled to other islands in a dug out canoe, carved from one of the tall Eucalyptus trees that cover the island. It was chilly, which came as a welcome change after the heat of Kampala and it was bliss to wrap up in a sweater and sit beside the fire place in the evening. The thick black night offered us a theatre of star gazing and the mornings arrived with an orchestra of bird song. I did not see our children. We travelled there with two other families and the mix of children was perfect. Throw a few younger boys into the mix and the girls shake off their pubescent concerns and turn into rope swinging Tom Boys. They ate together, slept in facing tents, swam together, and generally ran all over the island with joyous abandon. There is little opportunity in Kampala to walk freely, let alone run wild, so this was a chance for children to live for a few days in a strange kind of kid heaven. Wrapped up in an idyllic state of perfect childhood they managed to spend days together, problem solve together and despite the lack of lashings of ginger beer bare a close resemblance to the Famous Five. We took two trips to other islands, one to explore a former leper colony, now a secondary day and boarding school, and the other to hike to the top of a peak to gasp at the 360 degree view of the lake. We also had the chance to walk around Mukoni Village. The life of an African child is one of joy and barefoot freedom, and we were followed all the way back to our canoe by 6 children singing, skipping and laughing. They had quite special names, a case of an English word turned into an African name. Gift, Grace, Secret, Marvelous, Innocence, Adamson, and Frank ( whose parents must have found such names inappropriate for a young boy.) The children proudly sang us an English song they had learnt in school, happy to show off their English to the Mzungus. ( white people.) Dressed in torn, muddy clothes they sucked sugar cane with the widest of smiles. Joy and openness ran across their faces. They must be aware that once they grow up a life of hard work awaits. It was hard to leave the island. I cannot think of anyone we know who would not find it a magical place. I know we will return. Tomorrow we are leaving Kampala once again, but this time for five days. It is midterm break here which gives me pause for thought. We are half way through term one! We have been in Kampala over two months now and when I look back and reflect on the first weeks here I am sometimes shocked by what we have achieved. There is no denying that this was a hard move. Selling everything, storing valuables and up and leaving for Africa with less than 30 boxes is Crazy. Most people who move here are young and do so as a temporary but adventurous addition to their youth; or they move with a company that bestows upon them a shipping allowance. I have not met anyone in our position, married with two tweenish daughters, starting lives from scratch. We have moved out of one apartment (the infamous cockroach palace) and into a town house. We have purchased essential items ranging from kitchen knives to shower curtains and laundry baskets, we have bought a car and painted our house, settled into new jobs and school, made friends, laughed, cried, photographed, regretted, pondered and questioned our sanity; we have, without exaggeration, started all over again in AFRICA. It is an immense undertaking and there have been moments when I have wondered if we are not possibly quite mad. Yet here we are, half term starting today, and we are happily heading to the border of Rwanda, to a lake called Bunyoni. We will be staying on a little island in the lake by the name of Bushara. It is a 7 hour drive, up and down pot holed roads, through villages and a landscape I cannot yet imagine. We are going to a remote corner of Uganda that is cold in the evenings and bears a lake of crystal clarity. I promise to return with photos, stories and impressions. Casanova is the name of the dog who sits outside our front door during dinner. He is the dog who lives in our little compound of 8 homes. 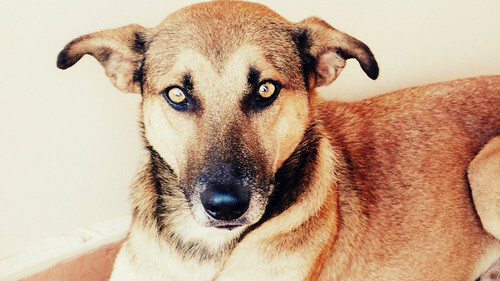 I assume he was a mutt pulled from the streets but he has the gentle eyes of a pooch looking for love. He forages for food and scrounges for love. His ticks and fleas force him to scratch frantically day and night. He sleeps curled in a tidy ball behind one of the houses, waiting for day light and sniffing for crumbs trailed by the split rubbish bags. And now introducing Happy Princess. Princess knows where everything in this house is. Anyone want to know if we have any batteries and how many of them? She’s your girl. Lolly pops I hid after a birthday party? She will be the one to know. She fills this house with cheerful disposition and eagerness to please. Still, we were very surprised when she readily agreed to go on the outdoor education trip. It was due to take place on the shores of Lake Victoria, learning to sail. She was mildly irritated about the sailing part, having been to a really fun sail camp in Trinidad (fun, except for the sailing.) She wanted the camping bit, the socializing, the camp fire and the chance to be surrounded by people and fun. Not only was she happy to go, but she turned the whole thing into a whirlwind of excitement, candy shopping and chats about sleeping bags and tents. Lists were drawn up and fierce discussions about tent mates, held. Finally on the day to leave, the morning OF we drop her off at school worried that she might just melt down but off she went with a smile and a wave. I am immensely proud of her transition and eventually happiness here. I think she has really nice friends. That is what it is all about. You could really be anywhere but if you have a tent full of friends, you’re good. Ok so now I get it. After 6 weeks of smelly and loud, very loud Kampala we finally climbed aboard the Beast and headed to Jinja. Jinja is the second biggest town in Uganda, it is about an hour and a half from Kampala and it sits on the mouth of the Nile. A backpacking industry has gathered on the banks of the Nile, offering world class river rafting, kayaking, horse back riding, Quad biking and for the people who do not envy those young overly imbibed 20 somethings, the gentle relaxation of a glass of wine beside an astonishing view. Within 20 minutes of leaving Kampala I was confronted with the colour green. Suddenly a land of green and plenty, gentle rolling hills of tea and sugar cane dotted with small villages and the bluest widest sky loomed ahead. This was a different Uganda. I met my husband on the Red Sea but we fell in love on the Nile. Literally. We sailed a Feluka from Aswan to Luxor under a still giant moon. That was a gentle long Nile, not very wide, but teeming with life. We were constantly amazed at how small children swam and submerged themselves in the filthy water. The Nile was a water highway, filled with boats, large and small. 17 and a half years later we were back at the Nile, but this Nile was wide, mighty and wild. Its waters licked the red earth and strained to reach the green pastures. It groaned as it pressed against the Owen Dam, angry that is was refused entry to the wilder rapids beyond. Egrets and Cormorant birds flew from rock to rock while the Nile perch and Tilapia played deep below. It was marvelous to imagine that each drop of water would eventually spill into the Mediterranean 4132 miles away. Our hotel was perched rather precariously on a cliff. We booked ourselves into a family Banda ( small house ) but once the infestation of cockroaches was revealed we stomped out with all the indignation that Trooper and Princess could muster. Cockroaches, I was brave about, but cockroaches inside the mosquito nets was a deal breaker. Once the flouncing and stomping ended we were directed by management to new quarters. We spent the night squeezed into a magical tent. All zipped up and tucked into bed; we could hear the roar of the Nile nearly a mile below. My outside shower faced an expanse of water that caressed two banks. It is a truly peaceful and happy place. 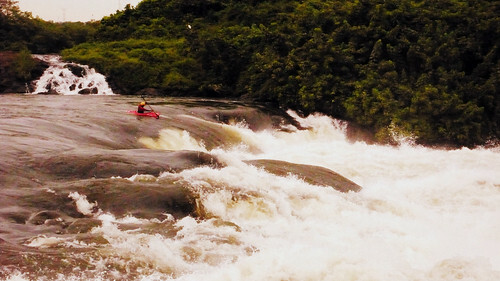 On the way back home, after a few hours spent swimming in the Nile, paddling on a raft and looking at some wild rapids known as Bujogali falls, it was a shock to the senses to hit the smog and congestion of Kampala streets. Just before the turn off to the spanking new high way that wraps around the Northern end of the city, a large truck sat on the Beast. The driver, realizing that he has just missed the turn, decided to reverse his truck to remedy the situation. Unfortunately for all concerned, he reversed straight into us until a chunk of truck was sitting on our bonnet. Poor Beast. As if it wasn’t ugly enough. I have glimpsed the Pearl of Africa and I can’t wait to go back and explore. Find me the next long weekend and show me the way.